Let me start this review by stating a disclaimer: I love Hermès perfumes. Yes, I love the classics. I especially love the overpriced Hermèsessence line. I even like all those fruity “jardin” ones. It’s a brand that really resonates with me. Saying this, they have had some duds. It seems like these days that a lot of these older houses have a high risk of “dud” as they try to keep up with new trends or attempt to make stuff for markets/demographics that don’t care about them. When I heard that Hermès was launching a new widely distributed perfume, Twilly d’Hermes, I was excited. When I started to see that the campaign was marketed to teenagers, I started to become less excited. When I saw that it was in a childhood-nostalgia Mr. Men styled bottled wearing a Twilly scarf, I really started to care less. But, in my world, you can’t really ignore the popular. I ended up trying Twilly a few times in store and I eventually ended up with a sample. Twilly reminds me of Elnett Hairspray and tuberose. It’s opening is slightly “functional fragrance” mixed with a lot of aldehydes. When this all settles, I pick up on a ginger-scented dryer sheet and a scrubbed down “sun-drenched tuberose”. Honestly, this perfume reminds me of a Mugler Alien flanker.¹ It has that same sort of “solar jasmine” thing going. The heart is an abstract white floral with a radiant warmth from amber and something that smells like ginger-scented towels. The florals are almost steamy – a mix of warmth with an ozone-like accord. Eventually the perfume turns into a powdery but warm/luminous amber. The powder is more “vanilla-scented talcum powder” than it is baby powder. This is how it dries down… a warm amber with vanilla powder. I expected something “young” with Twilly because of the marketing. Instead it’s something much more mature and nothing about it smells like candy or fruit cocktail. That’s good, I guess. Real talk – I was really disappointed with Twilly the first few wears. I really didn’t like it. It wasn’t because it was “bad”. It was because it reminded me of Mugler, another designer brand with a very different aesthetic.² Twilly didn’t “feel” like it was something that belonged in this brand’s lineup. As someone that likes the Hermès aesthetic, this “out of bottle” experience bothered me. The good news is that Twilly has grown on me with time. I love an abstract floral. Twilly is exactly that AND it’s wearing a bowler hat. That’s cute. Give Twilly a try if you like abstract white florals. Or perfumes like Montale Ginger Musk, Mugler Alien Eau Extraordinaire, Mugler Alien Flora Futura, Cacharel Catch Me, Elizabeth Arden Red Door Aura and/or Gucci Rush. Twilly d’Hermes comes in a few sizes with the 1.6 oz retailing for $100 at Nordstrom and Sephora. Victoria’s Final EauPINION – Solar white floral. It’s not the Hermès that I fell in love with. The perfume has grown on me. I’ll probably finish up my sample but it’s not something that I’m going to go out of my way and buy. The speculation is that Twilly was made for a younger audience. My speculation is that it is a Hermès perfume made for those that usually dislike Hermès, age has nothing to do with it. ¹And I’m not the only one. Jane of Daly Beauty mentioned this to me on Twitter, myself and Nick of Fumechat agree. I thought this so much so, that I started to wonder if I had an Alien sample confused with this one. I had to double check. ²I don’t want to sound like a hypocrite! I love the new Alien Flora Futura. But, that perfume feels like a Mugler, like it belongs in the Alien family. It fits with the house. What I didn’t like about Twilly is that it doesn’t really seem like an Hermès. If I wanted an Alien flanker, I’d wear one of the many ones of those that are available (and I already own). *Sample obtained by me. Product pic from Notino. 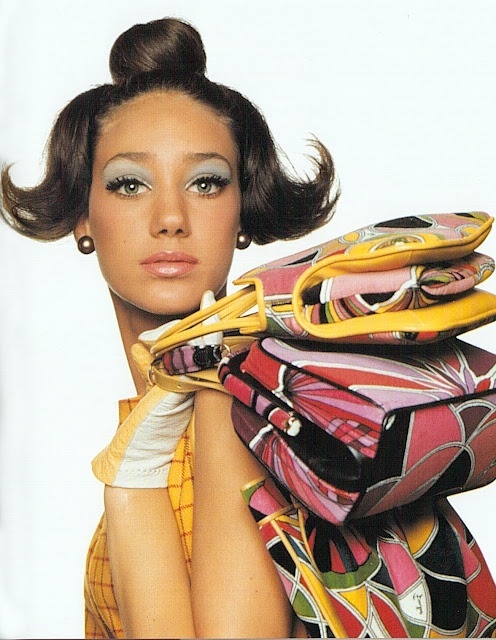 Marisa Berenson by Bert Stern circa 1965 pic from annaluks.blogspot.com. Post contains an affiliate link. Thanks! I still haven’t tried Twilly, but based on so many mixed reviews, I’m not really in a hurry to. Last time I was in the flagship Nordstrom, Twilly had just been released. A SA was dressed up to look like the Twilly bottle and was trying to spray it on people. That was all a little much for me plus the store was packed and anxiety inducing, so I skipped her display. I’ll smell it eventually! For me, I’m happy I tried it. But, it’s not something that I think I would have regretted NOT smelling (if that makes sense). There’s other stuff I like from Hermes much better. I keep going by their store to smell the new Hermessences and they are never in stock. I give up.